Camel pose, or ustrasana, is a beginner's backbend that opens the chest. 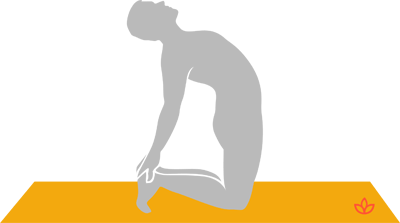 From a kneeling position, the spine and head are arched back while the hands rest on the heels. Camel pose both stretches the back and improves posture. Start in a kneeling position with your knees as wide as your hips. Tuck your toes under. Exhale and lean back. Rest your hands on your heels. Keep your hips over your knees. Avoid if you have had a back injury.